Each book is so unique and so promising. I hardly know where to begin! What did you find in your mailbox? Have you read any of these? Find more Mailbox Monday posts at I totally paused. I thought Mother, Mother was SUCH a great read, hope you enjoy it! The Vintage Teacup Club sounds good. Happy reading! 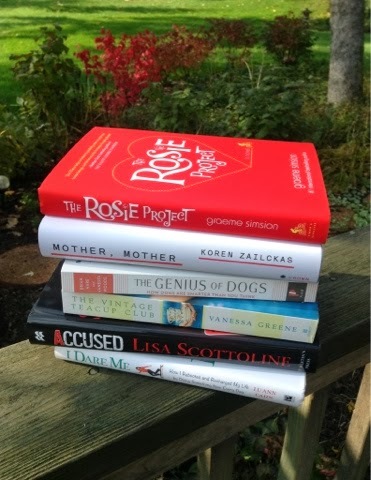 I've read The Rosie Project and thought it thin, demeaning, cheap film script like – my review at my blog http://messybooker.blogspot.com.au/2013/06/the-rosie-project-graeme-simsion-review.html (sorry for the blantant plug). Depends what you want your novels to do I suppose. I haven't begun it yet wondering if I'd question my own mothering capabilities. Yet it seems my worst mistakes would pale in comparison to this mother's! It is to be released Tuesday, November 5. It looks a bit “chick lit” ish from the cover, yet just might be a cozy break from something ominous. Well, Tony, I must say your comment here intrigues me. Off to read your review. Like the sound of the Vintage Teacup. Rosie Project mixed reviews? Some great titles there. I recently got myself a copy of The Rosie Project (too) – sounds like the quirky, warm and fuzzy I need in the lead up to the festive season! Happy reading! Ooooo I look forward to your thoughts on Rosie and Teacup Club. I enjoyed The Rosie Project. Was it a difficult or challenging read? No. Was it funny, charming, hopeful, and heart warming? Yes. Different strokes for different folks I guess…uh oh…now I'm a cliché. Seriously, I like a romance story and I'm interested in the exploration of issues around Autism and Asperger's. Lovely stack of books. The Rosie Project sure sounds great. Have a good week! I like the sound of The Teacup Club. And am enjoying seeing the warring views of The Rosie Project in your comments! The Vintage Teacup Club sounds really good. I recently got The Vintage Teacup book as well. Looks like a cozy read. Hope you enjoy your books! I've heard such great things about The Rosie Project, and hope it's one you enjoy as well! I just finished listening to The Rosie Project. I thought it was fun, quirky humor more than romance.